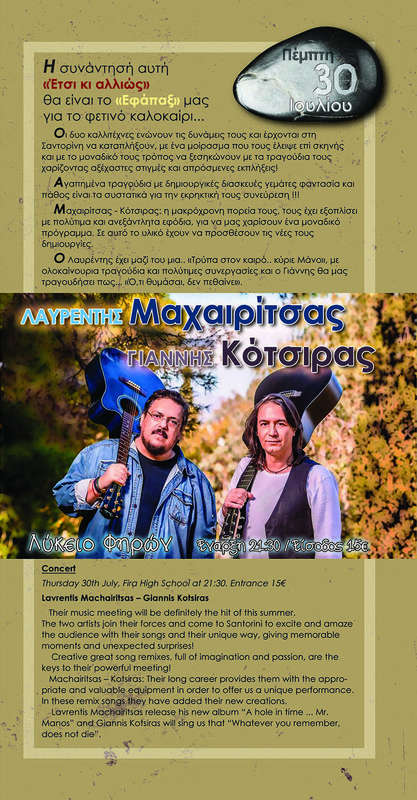 Two famous Greek artists, Lavrentis Machairitsas and Giannis Kotsiras, have come to Santorini today to excite and amaze the audience with their unique way. They have united their forces and present a show with great success, full of fantasy, passion and unexpected surprises. They will perform favorite songs from their long career repertoire, creative remixes and also new creations that will surely thrill you. Don’t miss this powerful meeting, you’ll enjoy unforgettable moments full of wonderful music.